Over 900 U.S. cities have enacted breed-specific legislation. Cities such as Denver, which resides within a state containing a state preemption law, have effectively implemented these laws as well. 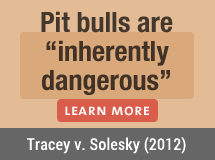 Appellate courts in fourteen U.S. states, as well as the District of Columbia, have upheld the constitutionality of breed-specific pit bull laws. Learn more in constitutionality. Many foreign countries have enacted breed-specific legislation as well, including: Canada, Great Britain, Germany, France, Ireland, Australia, and more. Please see a full list of these countries.